DESCRIPTION: You can barely see the black eye of this pretty snake. Also note that the yellow and black band at the base of the head actually transcends the scale separation which is rare. Exotic pet handlers are becoming more and more common in this day and age. Many people are seeking out new and unique animals to house and take care of on their own. Of course, snake hobbyists are no exception. In fact, one of the desired “exotic” snakes is the Eastern coral snake. Keeping this animal in captivity though, poses a large set of problems. The coral snake is highly venomous. Its bite contains one of the most potent venoms of any snake in North America. 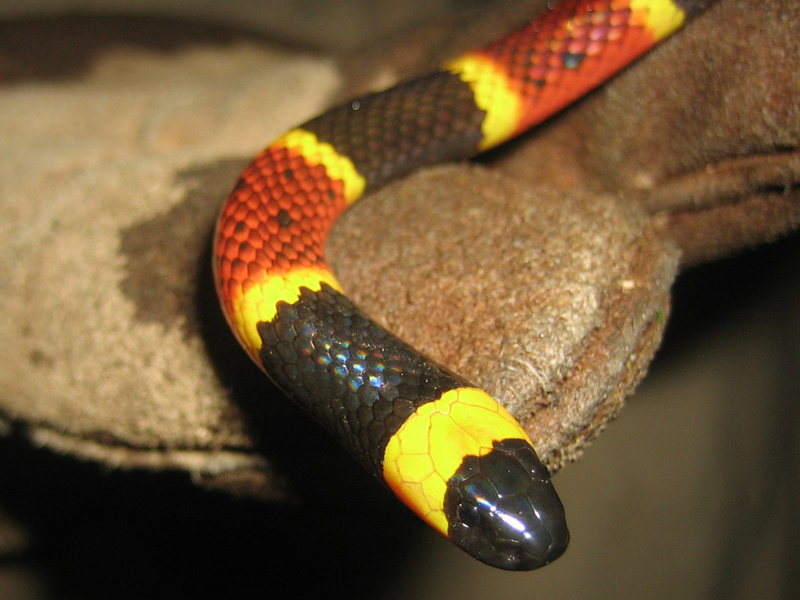 When a coral snake bites, it has a tendency to hang on to the victim, while most other snakes bite and let go immediately. Because of this, the snake is able to inject more of the venom into the bloodstream based on how long it hangs on to the victim. The venom itself is a neurotoxin; meaning when it enters the bloodstream, it immediately attacks the central nervous system and can halt a person’s ability to breathe. Despite this potential danger however, some are willing to take the risk and choose to keep this beautiful but deadly animal as a pet. In order to do this, one must know how to build an appropriate habitat for their specimen. Proper housing for a coral snake is an adequately sized aquarium with an extremely secure, screened cover for the top of the tank. Provide bedding to simulate the environment in the wild, supply good lighting, and a heat lamp. Coral snakes tend to be reclusive animals, so providing a hiding place is important as well. In fact, you will find that your snake will spend a good deal of its time in its hiding place. Lastly, water and a steady diet of lizards, small amphibians and reptiles will ensure a long, healthy life for your coral snake.